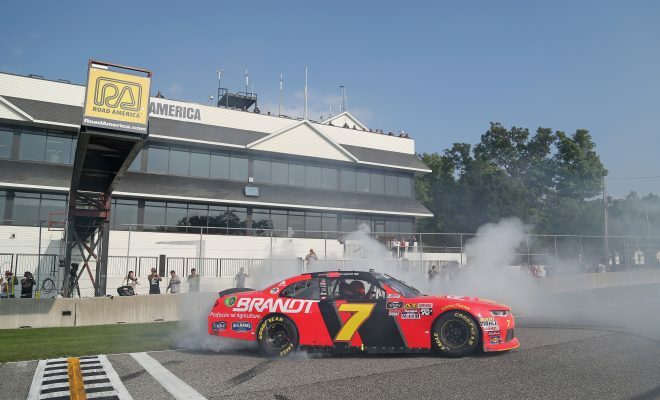 (via NASCAR) Justin Allgaier pulled away for his fourth NASCAR Xfinity Series victory of the year Saturday at Road America. Allgaier’s JR Motorsports No. 7 Chevrolet led 14 of the 45 laps in the Johnsonville 180. His second straight road-course win this season was the ninth of his Xfinity Series career. 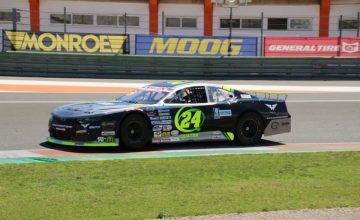 Allgaier cruised away to a 5.403-second margin of victory after his nearest challengers, Justin Marks and James Davison, made contact and spun with three laps remaining. Allgaier’s winning pass came at Davison’s expense as the Australian driver’s miscue with seven laps left opened the door. 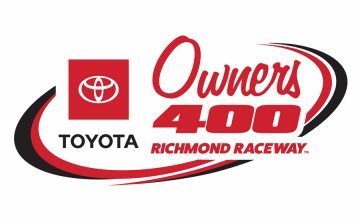 Pole-starter Matt Tifft brought the Richard Childress Racing No. 2 Chevrolet home in second place. Tifft later reported through social media that he made a post-race trip to the infield care center for fluids, but was otherwise OK.
Daniel Hemric took third with Cole Custer fourth and Elliott Sadler fifth on the 4.048-mile road course. Allgaier took over the series points lead from Christopher Bell, who spun out with five laps remaining after a bump from Tifft. Bell was forced to make a late pit stop and finished 23rd. NASCAR Hall of Famer Bill Elliott finished 20th in his first national series start since 2012. His GMS Racing No. 23 Chevrolet sustained significant front-end damage near the end of Stage 1. A later spin with seven laps to go dropped him further down the leaderboard. “I feel like I hit everything but the lottery,” Elliott said. Richard Childress Racing teammates swept the stage victories. Tifft led the first 10 laps from the pole position to capture Stage 1 for his first stage win of the season. Hemric led the final six laps of Stage 2 for his third stage victory in 2018. Austin Cindric led briefly during Stage 2 until his No. 22 Team Penske Ford lost power after Turn 11 on the long Kettle Bottoms straight. “It just blew up. At least we blew up in the lead,” Cindric told NBC Sports. Elliott Sadler, Cole Custer and Daniel Hemric all clinched playoff berths based on points, joining this season’s race-winners Allgaier, Christopher Bell and Tyler Reddick in the playoffs field. That leaves six spots open with three regular-season races remaining. The series’ next race is the VFW Sport Clips Help A Hero 200, scheduled for Saturday, Sept. 1 (3:30 p.m. ET, NBC, MRN, SiriusXM) at Darlington Raceway.